What a busy, busy week of crafting around here! (Hence my scarcity in this space.) I feel almost ready to slow down and be more present in the holidays now though since most of my crafting is complete. My biggest accomplishment of the week is the completion of Finn's car quilt. (Details about the top are here and the backing are here.) 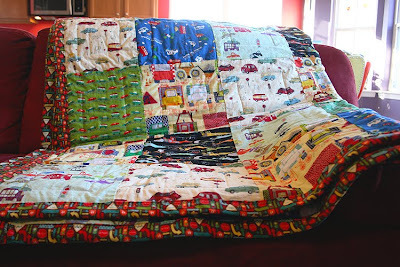 I finally finished all that quilting using my regular sewing machine. The binding is just the flannel backing cut 2.5 inches wider than the top and folded over twice onto the front and zigzag stitched. I have to say that I'm thrilled with how it came together, and I hope Finn will be too! I found a yard of car flannel (from Riley Blake's Wheels line) that I forgot I bought on sale several months ago. I had the intention of using it to make Finn a pair of pj pants, but since that same print, in cotton, is in the quilt and the backing of the quilt coordinates, I decided to make Finn a matching pillowcase. Now he's getting a whole bedding set! 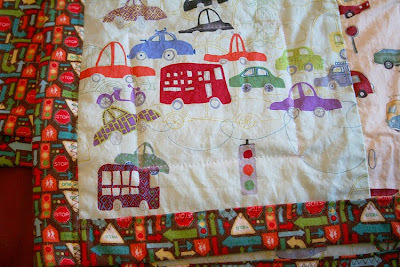 I used this tutorial and the quilt backing for the trim. I also had a brown circle print leftover from Finn's crayon holder from the same line that I used as a trim between the flannels. 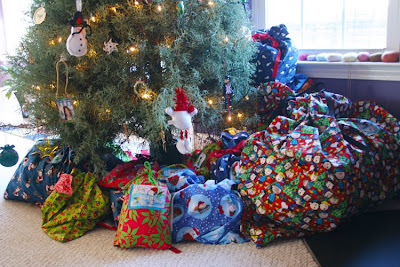 I don't think I've written much in the past about our gift wrapping system for birthdays and Christmas, although you can see them in this post from almost 2 years ago, but for many years now we've forgone the wrapping paper in favor of cloth bags. In the beginning we got some grief, "won't the kids be disappointed with no paper to tear?! 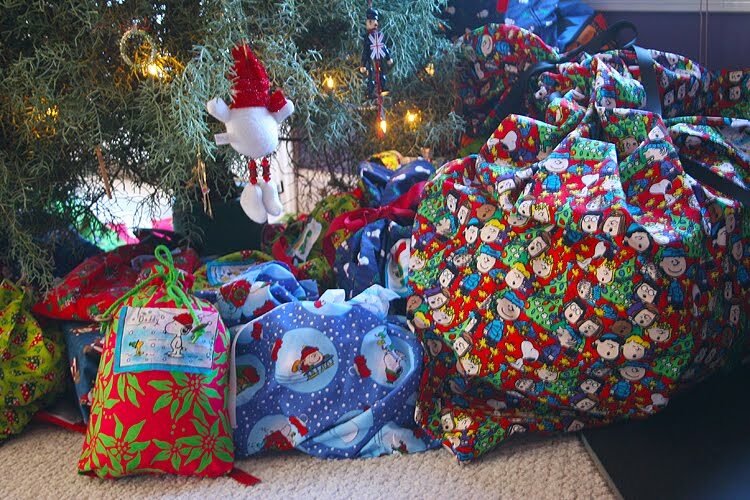 ", but it's amazing how attached the kids are to the memories of our wrapping bags. The Charlie Brown prints are the favorites and so I have to make sure that each child gets at least one present in a Charlie Brown bag. This year when I went to wrap Finn's pillow/pillowcase/quilt gift, I realized that my 2 larger wrapping bags were already in use. A quick stop by Joann's, and I managed to find 4 more yards of Charlie Brown fabric. Woohoo! So the big Charlie Brown-laden bag in the right corner of the photo below is the new bag. I keep my bags really simple, sewing up 3 sides and leaving a 3-inch turn-under at the top. Just below the turn under on one of the side seams, I sew about a yard of grosgrain ribbon, folded in half, into the seam. 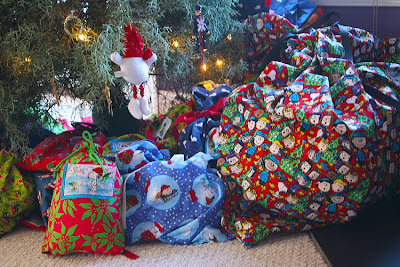 A very festive pile of presents under the tree! 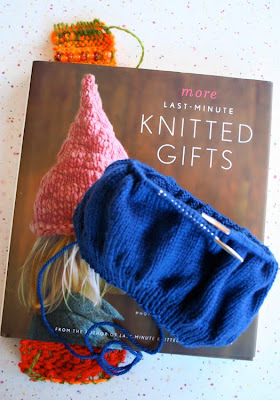 I'm joining Ginny's Yarn Along again today with my present WIPs. Elizabeth and I were flipping through this book when I first received it, and she declared that she would like a beret for Christmas, "in dark blue but not navy". So here's my attempt at a "dark blue but not navy" beret for Elizabeth's stocking. I've also been perusing Mollie Katzen's Vegetable Heaven trying to get inspired for some new dishes over the next week of celebrating and company. 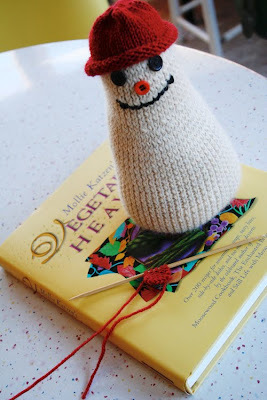 My other WIP is a knitted snowman who will be part of a craft exchange. He's almost finished...just needs a scarf! I hope all of your holiday crafting is coming along nicely! Okay, where to start? Love the quilt and pillow case. What a lucky boy! Love the beret and the snowman. I have that book and may have to make that hat for myself. And the fabric gift bags-- what a great idea. I think I am definitely going to try to make a couple of these and hopefully incorporate more next season. Thanks for your visit earlier and nice words. Is it okay if I email you with the details about the socks? Joy, I'm amazed. You're such a good mama. I love love the quilt. It turned out so beautifully and I really love the cars. I like the idea of bags. I too have the worried about the kids missing the tearing part but its that your kids have attached memories with the bags. Your little snowman is adorable and I can't wait to see the blue (not navy) beret. 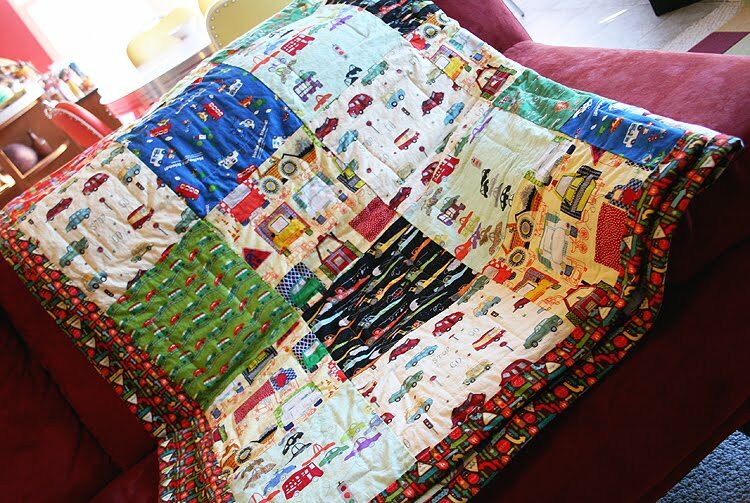 oops, I may have deleted my whole comment (and it was quite lengthy) but I came back to say I forgot to gush over the quilt, quilting is my first love and your quilt is just adorable!!! If my other comment was truly lost I was just oohing and ahhing over all the amazing things you've made! 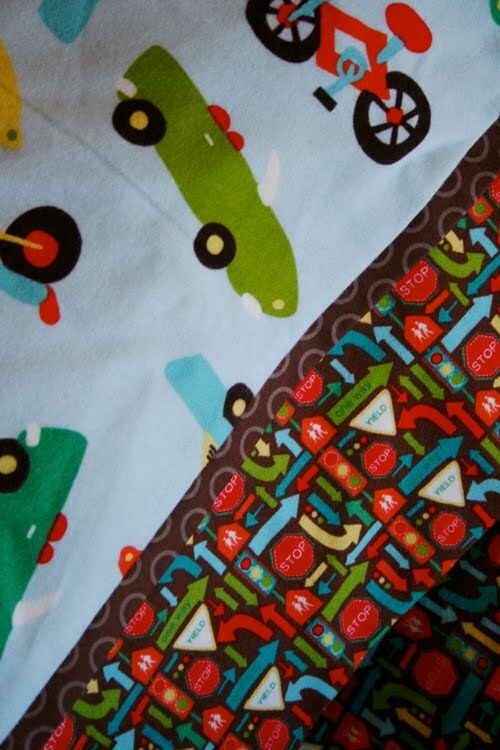 Your bedding set for Finn is nothing short of amazing! 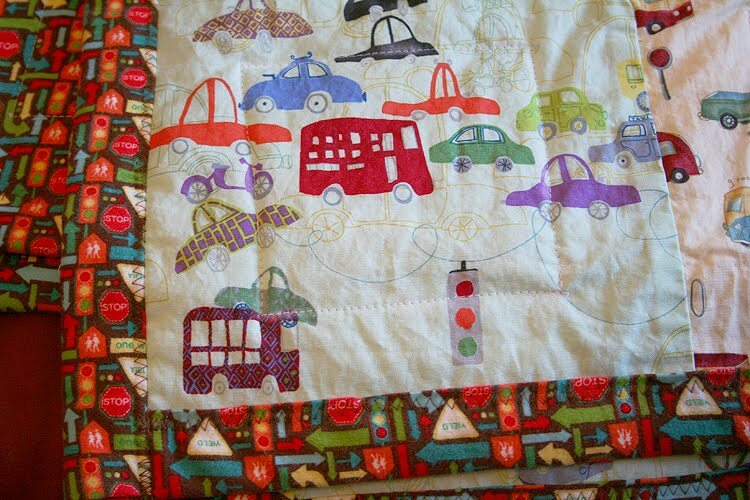 As for the quilt, I think everyone else has said it - It's fantastic! Wow, Joy! You are so talented. Everything is gorgeous!! I hope you post a picture of Finn's reaction to his new bedding. I bet he'll be thrilled! Great quilt! I once did a king size quilt (and had my head examined several times for starting it!) and found it was very helpful to roll up the part of the quilt going through/under the arm tightly like paper towels on a roll. Love, love your gift bags too! Very clever. that is so fantastic! What a lovely quilt! I can barely sew a straight line...thank goodness I can at least knit! 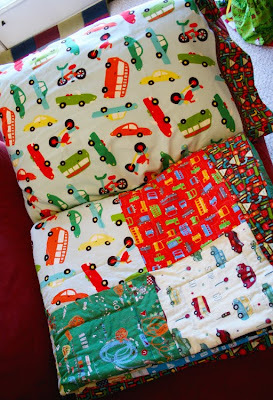 Joy- that quilt!!! Oh my goodness! I really love how you made the pillow cases. I am working on a quilt for my son as well. I am a bit behind. 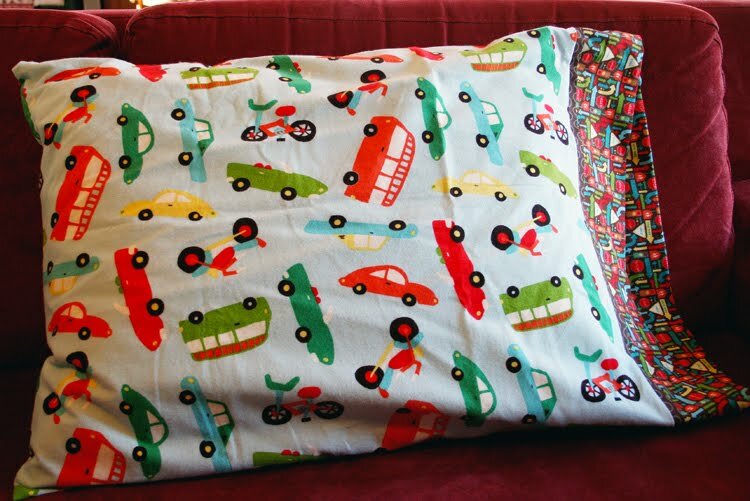 I have been wondering how to work pillow cases, and I really like how you trimmed them out. Awesome projects! Wow! Everything in this post is just fantastic! That quilt is amazing! Your little one is so lucky to have a mama who can create such works of art. I love the idea of Christmas bags. I think I'll hit the fabric stores after Christmas and see what I can come up with. It's great to make Christmas a little greener each year! Wow! What a lot you have going on! I'm impressed. Thanks for your comment on my yarn-along post. I finished the hat today, and cutting a few corners, I made the yarn last. Hooray! 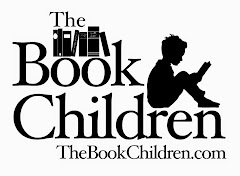 I'm excited to discover your book blog! Signing up with my reader; I always love a good book review. Well done on the quilt, it looks amazing! I love the idea of gift bags, we did a couple last year but I'm yet to make bags for all presents... not happening this year! Cute guy that snowman of yours. Now, I need to borrow your time-stretcher. How do you find time to do so much?! I'm impressed! I love the quilt! Great prints, and I love the colorway. I'm wanting to make some of those cloth bags too--they're on my crafting "wish list."